In a previous post I shared that we have recently been diving into the study of geography. I shared some books about maps and globes that we have read. 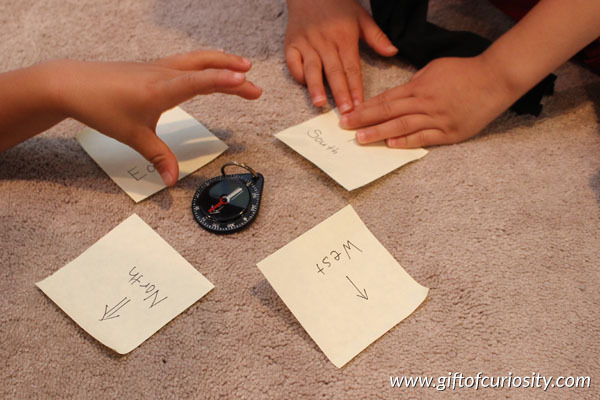 I also shared the sequence of Montessori mapping activities we did (and that my kids loved!). While learning about maps, we have also spent time discussing directionality. 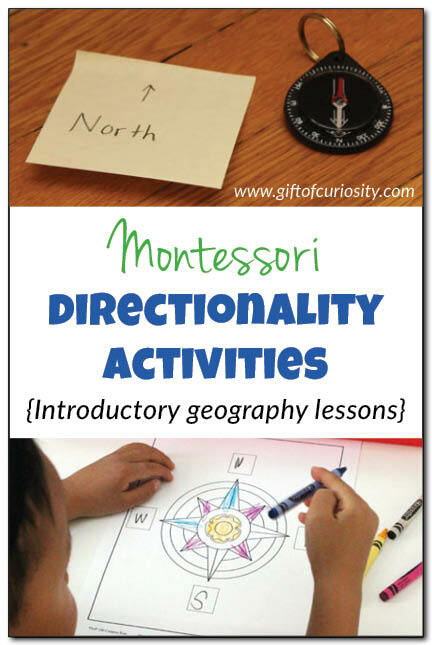 In this post I’m sharing several Montessori directionality activities we have done to learn about the cardinal directions (North, South, East, and West) and using a compass. All of these activities have been very well received by my kids in our study of geography. Note: You can find more kid-friendly geography activities on my geography unit study page. During our reading of books about maps and globes as well as our lessons on mapping, my kids began to learn a bit about the compass rose. The compass rose is a figure, frequently found on maps, used to display the orientation of the cardinal directions. 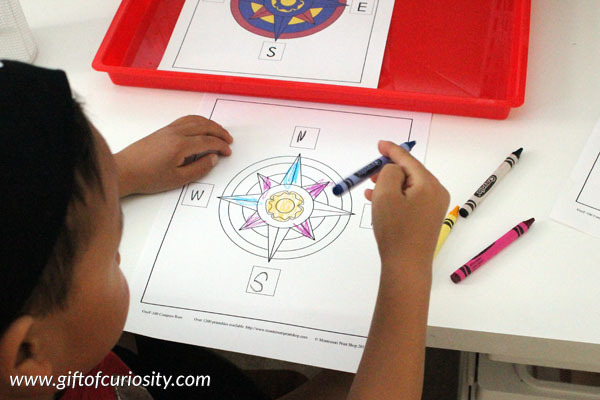 My kids showed such keen interest in the compass rose that I thought they would enjoy coloring in their own. I printed off a free compass rose printable from Montessori Print Shop (the link is to their page of free printables, scroll down to see the compass rose download.) I placed a control compass rose on a tray along with a blank compass rose and some crayons. My kids then colored in their compass roses by following the control. 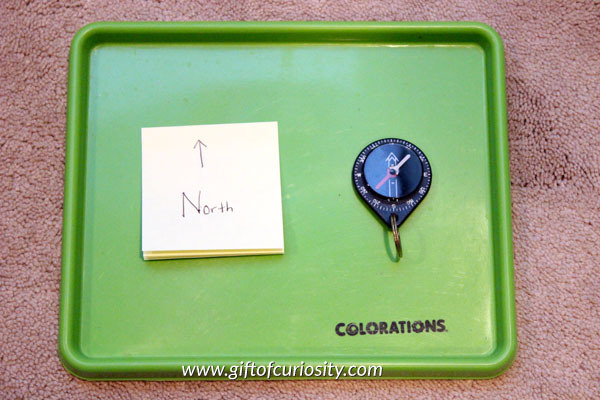 I placed a compass on a tray along with several sticky notes labeled “North” with an arrow pointing up. 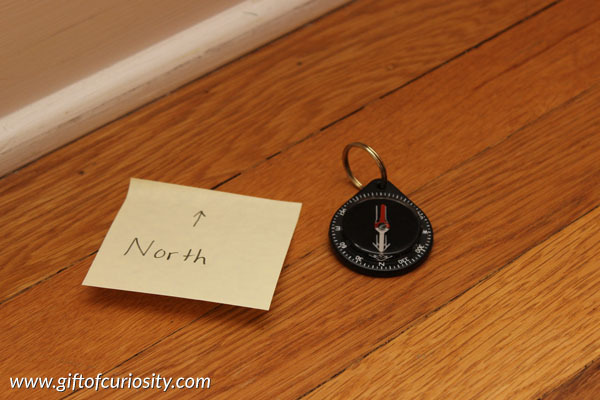 I showed my kids how to use the compass, by lining up the ‘N’ with the arrow to find North. After my kids were successfully able to find North on a compass, I decided to teach them how to find South, East, and West as well. As with finding North, we found the cardinal directions in several rooms of our house, including the office. 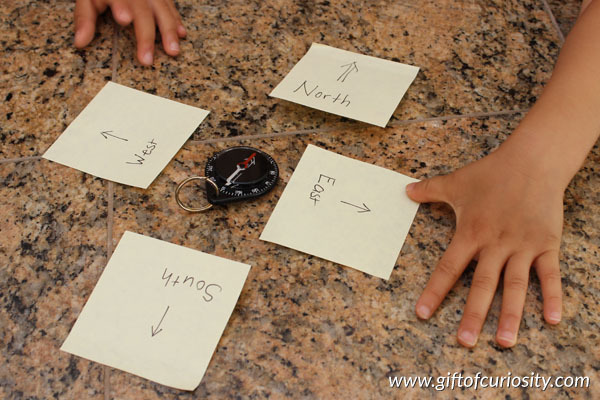 . .
Once my kids were comfortable using the compass to locate North, South, East, and West, I created a little game for them to put these skills into practice. I created six cards with instructions on them like “1 step North” and “2 steps East.” I placed the cards into our differentiated instruction cubes . Then I grabbed a compass and we all headed outside. 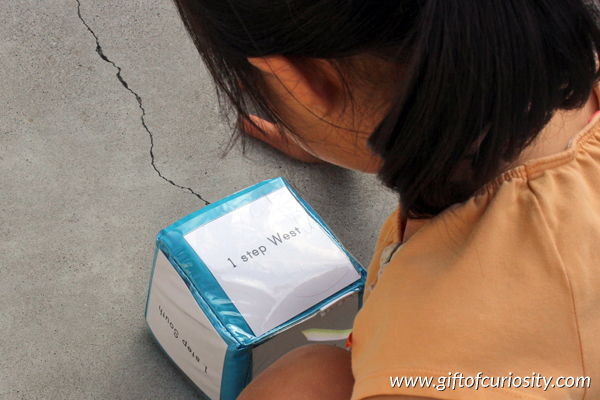 XGirl started by throwing our differentiated instruction cube and reading the sentence that came up. “1 step West,” she told QBoy on this particular turn. QBoy then used the compass to locate West and take a step in the indicated direction. We repeated this a number of times, with both kids getting a chance to throw the cube and both kids getting a chance to use the compass. You can download the cards we used to play the Follow the Directions game by clicking here. If you don’t have a differentiated instruction cube, you can simply put them in a pile and select them one at a time. You can find more kid-friendly geography activities on my geography unit study page and my Geography Activities for Kids Pinterest Board. 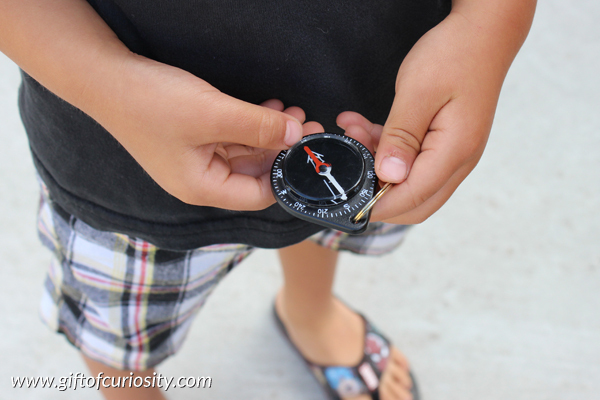 Follow Katie @ Gift of Curiosity’s board Geography activities for kids on Pinterest. Just wanted to say thank you for thèse amazing activities! I should have started my year with them (I’m doing passports & cardinal directions with my esl students – 6-9 year lods). They LOVED the compass and directions activity and I’ll happily use the idea of learning the continents through making their own globes – EXCELLENT, all of it. I’m so glad to hear your students have enjoyed the activities. All the best to you and to them!